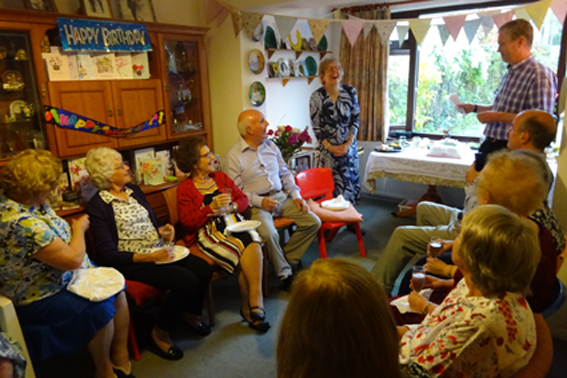 This week saw my mum’s 80th birthday, and with it a gathering of friends and family. 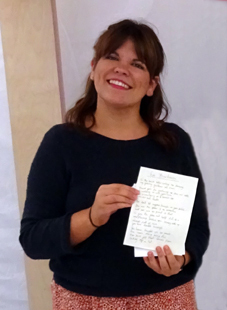 At the recent Malvern Autumn show we met a wonderful poet, Erin Bolens. She was there as a part of a Poetry Takeaway event, where you give the poet some interesting facts about a person and then return later in the day to collect the poem. It was a wonderful poem, which I read out at the party as a part of the toast, as in the main picture above. It was also the official unveiling day for the poppy sculpture. I will do another post showing the process of making the sculpture over the last few months, but here it is in its finished form. We delivered and assembled it a day early to make sure it was all OK. 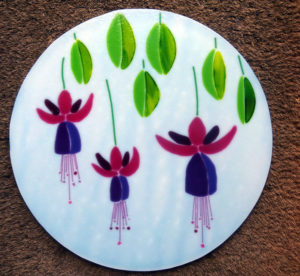 Following the earlier success, it was time to make another fused glass table top. The above picture shows the final top, as fitted to a table I made on the forge a while back. 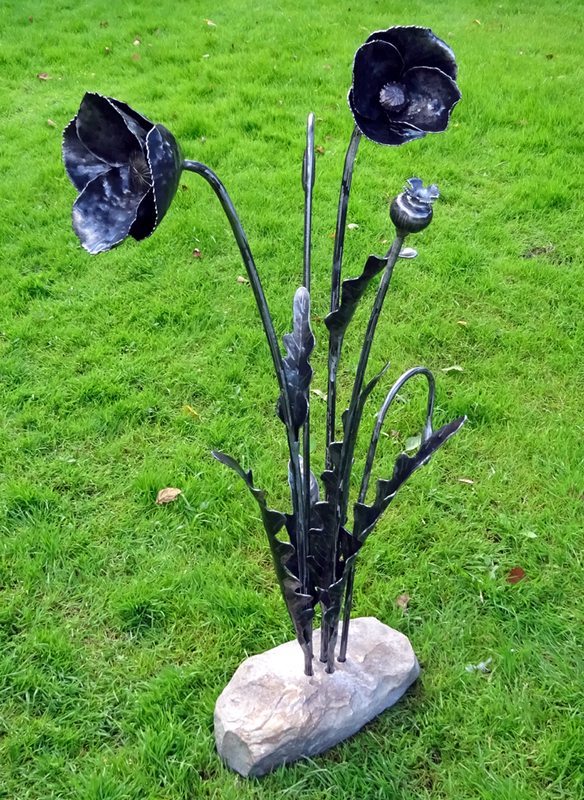 It uses a very large industrial gear as the top, with organic forged legs held in place with a leaf wrap. The process to produce the table top is the same as that on the table top on my last post. 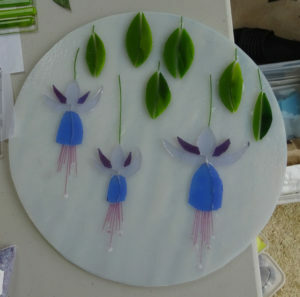 It took 4 stages of firing to turn the basic cut glass into the final design, as shown in the pictures below. 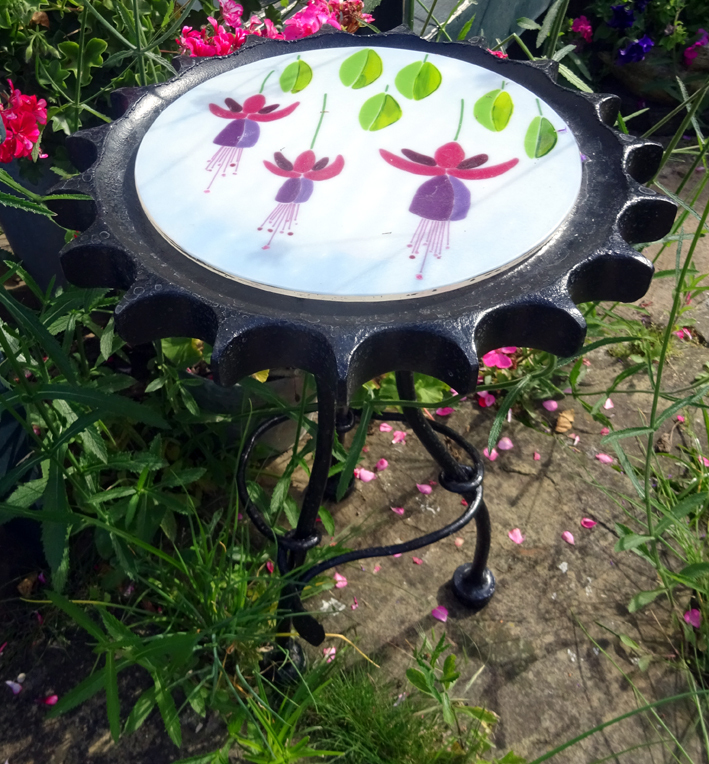 This one was based on our favourite flower, the fuchsia. It never fails to amaze me how the colours come out, just as they do when firing the glaze on ceramics. The picture on the left shows the first stage with the cut glass on the white background. The picture on the right is the end product, 4 firings and about 5 days later.